Where Katie learns that you always start your mixer on the lowest speed. This entry was posted in katie. Bookmark the permalink. Love that spice rack in the background…mine are all shoved in together on a cupboard shelf. It was organized when we moved in 2.5 years ago…never since. That's an elfa storage system from The Container Store. We bought it at our last house, and since it clips to the door, it was easy to bring with us. I love it. Oh, dear! Hopefully, Katie also learned how to clean up her own kitchen disaster! LOL! Actually, I was so mad that I laughed (because I knew she didn't mean it and knew she was upset) and thought about St. Therese and really tried to offer it up. 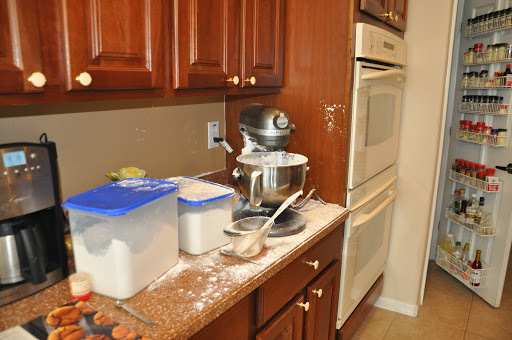 It took us at least 15 minutes to clean up working together (and my mixer still isn't fully clean), and unfortunately, this was on Sunday morning and the cookies were needed for our parish picnic right after Mass. So, I really felt that I was getting my just desserts for not doing my “work” on Saturday instead of Sunday! Oh, Katie, I still make that mistake and I have been baking for over 30 years! Barbara, I LOVE this kitchen, and feel so very lucky to have it. Blessed. The next one probably won't, so I'll enjoy it while I can. And I use the double ovens more often than I thought I would. This week especially. HAHAHAHAHHAHA! Been there, done that, couldn't even blame it on the kid. That's a spice rack after my own heart…nice! You can never have too many spices.